Egypt Life on the Nile Activity - HISTORY'S HISTORIESYou are history. We are the future. For this activity you get to think about all that you have learned about ancient Egypt thus far. With that knowledge, you will work together to write a short play about what it was like to live and work along the banks of the Nile River thousands of years ago. In class, you will be assigned to one of five groups. Each group will be responsible for writing one short act for our classroom drama. Follow the guide below to frame your writing. 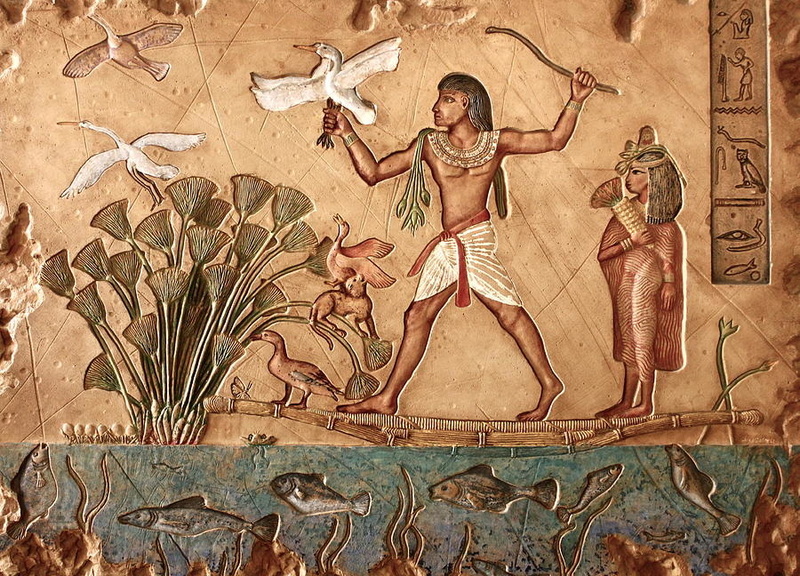 For each act, think about what you know and include as many elements of life on the Nile as you can, all while creating an entertaining script. Act One: It is early morning. Three children, who should be fast asleep in the nursery, are wide-awake. One of the children is holding her face. She had a toothache during the night. Their mother fried up a mouse to put on it. While the mouse is cooling on the table, the family’s cat steals it and runs out the door. The mother chases after the cat. They are very good children, but they are bored. With the rest of the house sleeping, they go outside and watch Pharaoh’s pyramid being built. The children run off toward the pyramid. It is much further away than they had thought. By the time they arrive, they are hot and hungry and tired. But they are not allowed to take a nap at the pyramid site. A workman gives them a drink and sends them away for their safety. Act Two: With the pyramid workers beginning to complain to the overseer, feeling as though their adventure at the pyramid is over, and quite sure that there will be trouble when they return home, the children begin walking along the shore of the Nile. They see a boat, and climb inside. With the sun riding high, they crawl under the folded up sail to get out of the heat. Being very small children, and having spent much of the night awake, they fall asleep. A short time later, a fisherman pushes the boat into the Nile and climbs aboard. He must catch fish for his master. Otherwise, he will not be paid. Act Two Cast: Children, fisherman and any other Egyptians you might see working along the Nile - could be in the fields or at or in building sites. Act Three: When the fisherman rows ashore he asks his friend who is harvesting dates to get the children home. The dates must be harvested soon or the crop will be lost. The date harvester tells the children he will send them home with his wife, but his wife is not in the house. She must be washing clothes down at the Nile. But the gods are smiling. His friend appears on the way to market with a string of camels. He will have his friend take the children into town. The children ride the camels. Act Three Cast: Children, Fisherman, Camel Seller, Anyone else who might live or be working along the Nile. Act Four: At the market, the camel seller drops the children off at the baker’s. The baker is glad to take the children. He gives them bread to eat while he decides how best to get them home. Because the bread is cooking, he cannot leave his shop right now. His daughters are busy making new bread, so they cannot be spared. His wife has gone to buy some barley from the granary. Fortunately, his friend, the jewelry merchant, stops by for bread. He is on his way to the temple with an offering. The jewelry merchant will bring the children with him to the temple. Surely, the priest will know what to do. Act Five: The temple priest is finishing the Daily Rite as the jewelry merchant arrives. The temple statue is being replaced inside the shrine. The priest thanks the jewelry merchant for his wonderful offering. The necklace is put around the statue’s neck. The priest speaks magic words as everyone looks on in excitement. The priest and children set off for the children’s home. When they arrive, the children’s parents are running up from the Nile.